After creating heat, light and wind responsive clothing and accessories, creative studio The Unseen have developed a colour-changing hair dye that responds to fluctuations in temperature. The Unseen was founded by Lauren Bowker, one of CR’s Creative Leaders 50 (read our feature on the company’s work here). 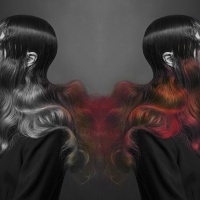 The hair dye was unveiled at London Fashion Week on Friday in partnership with modelling agency Storm. It is semi-permanent and comes in various colours from bright red to pastels. The dye contains carbon based molecules which undergo a chemical reaction when the temperature drops or rises, creating different colours. The studio is now looking for commercial partners to take the product to market and is also developing a permanent version of the dye.